When I was a wee little thing living in a tiny two-family house in Clifton, New Jersey the one thing I loved beyond anything else…was chocolate pudding. We had only been in the United States for a few years and we weren’t exactly adventurous eaters yet, though we are now. But back then, our diet rarely strayed from traditional Pakistani food and Western style desserts were an even rarer thing, besides store bought stuff like ice cream and cookies. I remember, though, when my mom used to bring home these magical little boxes full of mysterious powders which would turn into different colors and consistencies when mixed with water or milk…pudding and jello! My little child-mind could not handle the excitement. While jello was cool and everything, pudding was the real deal. That’s what got me hooked on chocolate (more or less addicted to dark chocolate, especially). My mother made them rather well. As well as you could out of a box, anyway. But there were nights when both my father and mother were out working or studying and my grandmother would take care of my sister and I. She has no idea how to make anything chocolate! But she is an extraordinary cook otherwise. We asked her to make us some pudding and, well, she did. Except every time she’d make it, she’d accidentally burn it. Where there should have been smooth creamy pudding, there were bits of char that stubbornly stuck to the tongue. But, you know, I have that wonderful memory of my grandmother making us something she knew we enjoyed, even though she hadn’t the faintest idea how to make it or what the hell kind of child would eat instant-anything. I don’t care. I love her for it. I love that pudding with the burnt pieces of something or other. And I adored my mother’s chocolate chip cookies, which, if you didn’t eat them straight away, you’d probably break a tooth. But have you ever had my mother’s halva? Her doodh savai? Her feerni? Her carrot halva? Everything prepared with love and butter and sugar, painstakingly stirred over a blindingly hot stove for hours until it reduces, reduces, reduces…to perfection? Try my grandmother’s desserts. Sure to blow your mind. And to think, I would even compare my little party tricks with cake and cookies to what my mother and grandmother can do with a packet of crushed vermicelli. While I do bake rather well and rather often, alhamdulillah, I have made some pretty exquisite desserts (if I do say so myself, ahem ahem, mashAllah), but none of them, in their formulaic stirring and pouring, none of them compare to a cold rasmalai. Or a dish of kheer sprinkled with pistachios and almonds. Or a glistening globe of gulab jamun. Which, to this day, I haven’t the faintest idea how to make. None of it! I have no idea how to make any of it. Well..the halva I can manage with my mother standing watch..
…But, I pride myself in my chocolate and flour adventures…because I’m a bit too nervous and scared to even touch upon Indo-Pakistani desserts. The picture above is of the cupcakes I made this morning for my youngest sister. 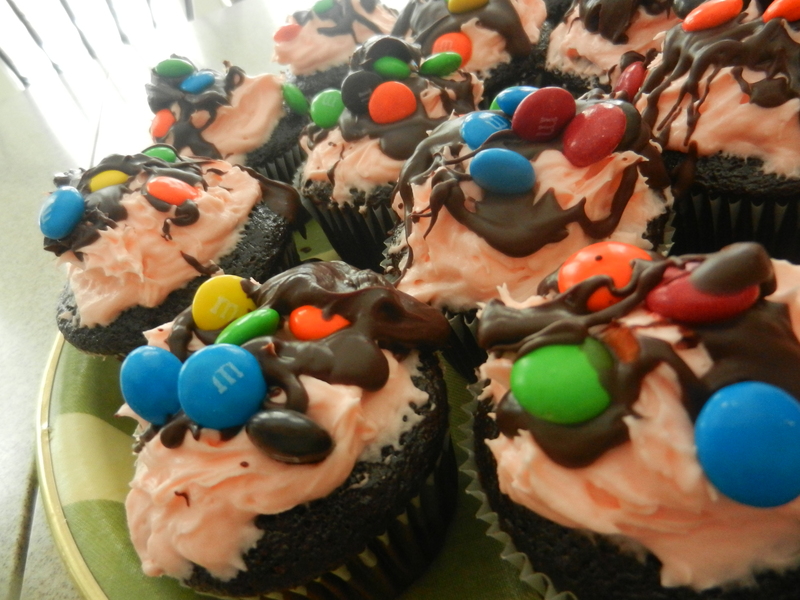 They’re from-scratch chocolate coffee cupcakes, topped with homemade pink cream cheese frosting, and drizzled with a homemade chocolate sauce, and then sprinkled with M&M’s (storebought, merf). Sleep evaded me last night. as if that alone could have brought you to me. I felt you thinking of me. Today, my little sister is having a birthday party. I’m smiling to myself, thinking of that. I made the cupcakes, anyway. They were chocolate, you would have liked them. But then, I added coffee. You wouldn’t have liked that. But I think, if I had said, please? Please, let me feed you? After my workouts my appetite spikes. Pretty sure it’s normal, and the trick is knowing what NOT to eat. As women, I feel like our emotions in daily life have us steering towards rich, comforting or just plain bad-for-you foods. Yesterday, I was at a garage to get an oil change for my car. I gave into a moment of temptation and bought a bag of not-so-healthy snack food from a vending machine. And I regretted it big time. I think sometimes we go for foods that are rich, high in calories, high in carbs, etc because it’s just more satisfying. But the truth is a light dish can be just as satisfying! I’ve been on a major salad kick, lately. I consider myself different from most people because I don’t put any kind of dressing on my salads. Sometimes, I even like to eat salad with my fingers. Whole grape tomatoes, wheels of cucumbers, spears of peppers, a crunch of crisp greens, a burst of sweet fruit, and a sharp bite of a little cheese. I know it sounds stupid, but it allows me to connect with what I’m eating, and it’s no longer a fork-to-food-to-mouth mechanical thing anymore (or maybe it’s because I’m Pakistani, and we eat everything with our fingers). Alhamdulillah, it also helps me have control over what I eat AND it makes me appreciate exactly what I’m eating. And who needs that greasy, creamy stuff? It totally makes the point of a salad moot. And it masks all of the natural deliciousness of the real stuff in the salad. 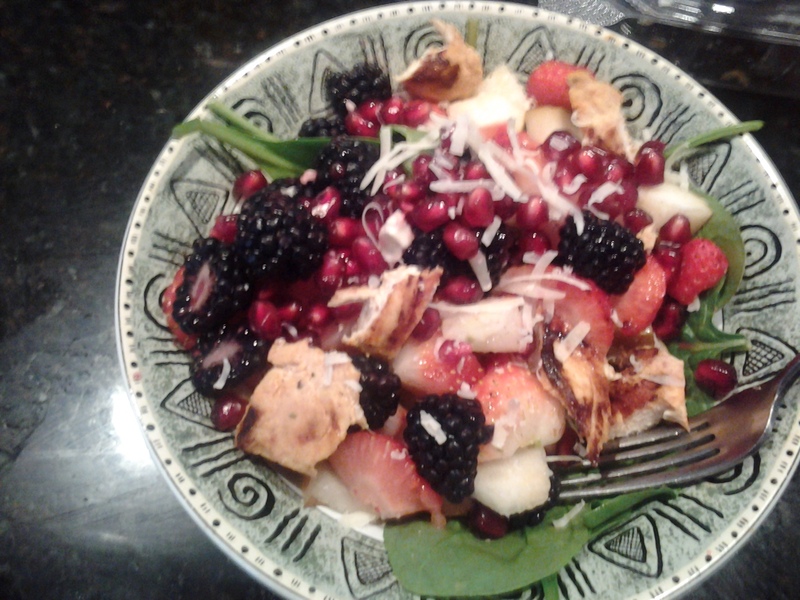 There’s some grilled chicken, strawberries, blackberries, pomegranate seeds, pear slices, and a modest sprinkling of mozzarella cheese, all on a bed of fresh, crisp baby spinach. No fattening ocean of dressing. No overwhelming tang of vinaigrette (although, done right, it can be good, but not for me). Try and eat this with your fingers! You’ll have a blast, I promise. If you have a spouse, imagine how romantic it would be to pop a pomegranate seed, a blackberry, or a lovingly folded leaf of spinach into their mouths? Awwwwwwwwwwwwwwww. Go on, you know you want to. Anyway, earlier tonight after I crawled off the elliptical machine and Gollum-ed my way up the stairs to my kitchen, I had only one thing in mind. I tenderly opened the door to my fridge, and grabbed the box of arugula, a glorious jar of marinated artichoke hearts, feta cheese crumbles, deli-style turkey (halal for moi, s’il vous plait), unsalted sunflower seeds, a single button mushroom and a quarter of a pear. I took about a handful and a half of arugula, two artichoke hearts (shook off the excess marinade and then ripped it up into pieces), a little sprinkling of feta cheese, sliced my pear up into little triangles, tore up two little slices of turkey, tore up the mushroom, and threw in a sprinkle of sunflower seeds. And I grabbed a fork because sometimes I don’t eat salad with my fingers. And then I ate it. Oh, man. Words cannot express how good it was. Arugula has a bite to it. It’s a bit bitter, but not too much. If you’ve ever eaten a mint leaf straight off the stem then it kind of tastes like that. Combined with sugary pear slices, tangy feta, and the rest of the ingredients (I’ll ease up on the adjectives because I don’t want you to get too hungry), it’s pretty much all you’d ever want from a salad. And no dressing! The artichokes take care of that nicely (go easy on these, too, please!). I made this salad a few days ago as well, except I also added some carrots and used some imitation crab meat instead of the turkey. I have a hunch that the turkey is probably better for you, but I could be wrong. Any salad that HAS to be blogged about has gotta be pretty incredible, right? Says the woman who posts puppy and cat gifs. Later tonight the house will, inshAllah, be flooded with guests for dinner. Among our guests will be a local Sheikh and his family who are all Filipino-American, He has made a huge difference in our community, mashAllah, and will continue to do so, inshAllah. So, in his and his family’s honor, I whipped up this irresistible treat. I made this dessert a few years back before the Sheikh moved to town. It’s absolutely AMAZING. I found the recipe on thepioneerwoman.com, who featured it from a user named “Ivoryhut” (to whom I owe my eternal gratitude), so it’s definitely not MY recipe, but I did tweak it. The original recipe had pecans and pitted dates. I prefer medjool dates over pitted dates, but since we had neither, I used ground dates which are used in Arabic baking recipes. I didn’t have any pecans, so I opted for same flaked, sweetened coconut. I also used more brown sugar, less white sugar, and decreased the sugar content overall, because I don’t really like overly-sweet desserts, and I try to avoid white sugar as much as possible. Now, this recipe is NOT healthy. Ok? I repeat. NOT HEALTHY!!!! It has three sticks of pure butter, over a cup of sugar, glutenous white flour, 4 rotund eggs. Not to mention the fatty savoriness of walnuts, the rich sweetness of dates, and the earthy, deep sweetness of coconut. See what I mean? Avoiding it is fruitless. You simply must eat it. There’s no way around this one, folks. If you want MY version of it…increase the brown sugar to one cup and decrease the white sugar to less than 1/4 cup and add 1/2 cup to 1 cup of flaked, sweetened coconut. Instead of greasing the pan, cover the pan with parchment paper, and just lift the cake straight out when it’s cooled, and then cut into bars. The dessert is originally called “Food for the Gods”, but being Muslim, I’ve got problems with that (deal with it!). So I’ll stick with Ivoryhut’s name “The Bar”. I’m also wondering how this would taste if I decreased the butter and added some coconut milk. If any of you are curious enough to try it, let me know how it turns out! Today, while perusing through the aisles of my local Costco with my little brother, I was overwhelmed by the sheer amount of products, brands, produce, merchandise….everything contained within the four walls of this massive store. How MUCH do we have? How MUCH do we really NEED? It’s really shocking to me how easily we forget the kind of position we are in. We walk out of our houses, into our cars, drive ourselves to stores, and buy the food we can afford. I am in awe of the statistics involved in being one of the only people on the face of the earth who are able to do this on a daily or weekly basis. How many people don’t have access to clean water? How many people are unemployed, homeless, hopeless? How many people can’t afford bread? How has Allah favored us above much of His creation? How little do we show our appreciation? Tomorrow night, we’re having another dinner party at my house, inshAllah. At some point tonight, I’ll be busying myself in the kitchen making desserts for my fellow brothers and sisters in Islam, inshAllah. It moves me to realize how blessed we are to have what we have, and to be able to do what we do everyday. It could have easily been so different. It’s not everyday that I’m caught off-guard by the blessings of Allah, inshAllah it happens a lot more. I find myself getting so comfortable with my little luxuries. How I can just pop into my kitchen and whip up a cake with the best appliances available, Alhamdulillah. It wasn’t so long ago that I was in Indonesia, and baking a cake in a tropical, rural village…well…that wasn’t so easy! I got stung in the face by a gigantic tropical hornet during the process. And the quality of the ingredients was noooo where near what I can get myself in the states. The Prophet (saw) said that the “house in which there is vinegar is not devoid of condiments.” (Tirmidhi). SubhanAllah, just by the jug of vinegar that sits in my pantry, my meals are complete. Never forget how much we are given, and everything we do, write, say, eat is for the sake of Allah and by the Grace of Allah. Tonight, my mother had one of her dinner parties. Her dinner parties are always fantastic, delicious, cozy, and VERY Pakistani, desserts being no exception. Not that Pakistani desserts aren’t great…I mean…gulab jamun, anyone? However, nary a chocolate morsel would be seen if my mother had her way…and so for the sake of the children…those poor, poor children (think of the children!! ), I decided to whip up…this. 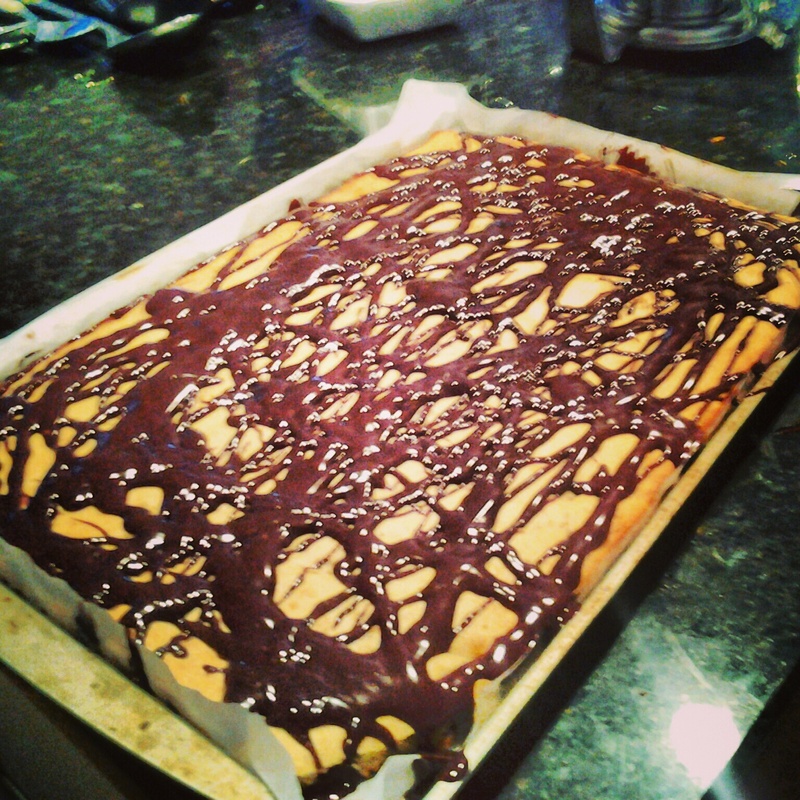 A banana-chocolate-chip-peanut butter cake with peanut butter-chocolate sauce (I do not like icing or frosting, I refuse to use the terms). Or as I like to call it: Lunchbox cake, because it reminds me of my childhood and the bananas, cookies, and pb and j’s i would eat at school. I was a bit wary of using crunchy peanut butter because I thought the texture would be weird, but it turned out amazing (Alhamdulillah). 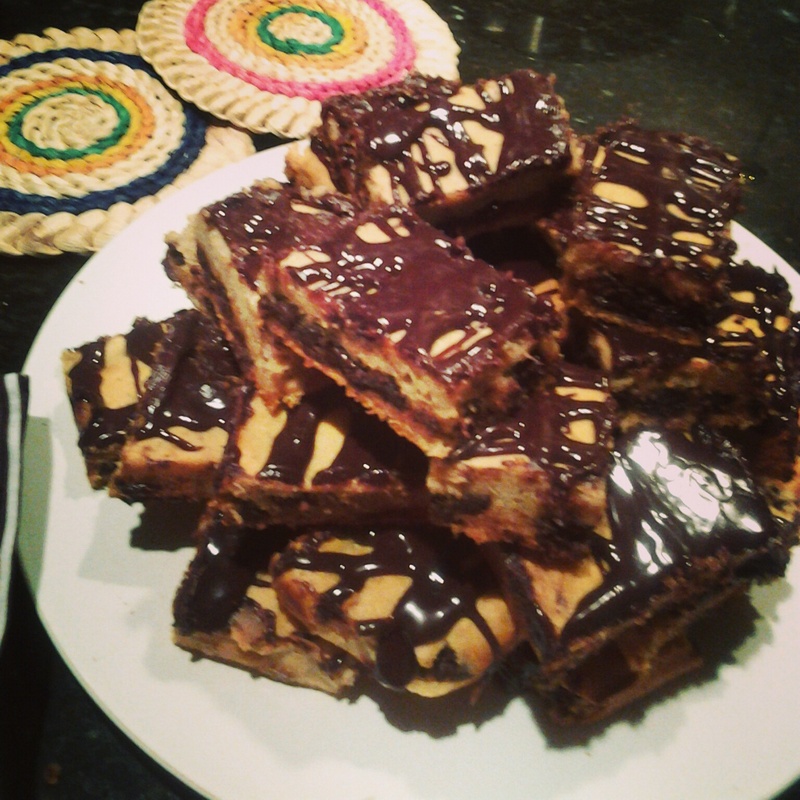 So here it is, in all its chocolatey-banana-y-peanut buttery glory. 1/3 cup powdered sugar, or more to taste. Cover a large sheet pan with parchement paper and set aside. In a standmixer, mix bananas, butter, and sugar until combined. Then, add the eggs one at a time, mixing between each addition. Add crunchy peanut butter, honey, and vanilla, and mix again until combined and small chunks of banana remain. Set aside peanut butter-banana mixture. In a measuring cup, measure out milk, add vinegar, and set aside to allow it to turn to buttermilk, about 5 minutes. In a separate bowl, sift together flours, nutmeg, allspice, and baking powder. If you chose to add the salt, sift it in now with the dry ingredients. To the peanut butter-banana mixture, alternate adding the dry ingredients and the buttermilk. DO NOT OVER MIX! Mix just until combined and no flour can be seen. Gently stir in the chocolate chips. Pour batter into the sheet pan, smooth and even out with a cake knife, and gently tap the sheet pan against a hard surface to force air bubbles to the surface. Bake at 350 F for 30-35 minutes, or until edges turn golden brown. Let the cake cool while preparing sauce. Heat milk in a saucepan on the stove on medium heat. To the milk, add the smooth peanut butter and gently whisk until combined. Once the mixture begins to bubble, take it off the heat and add the chocolate chips. Whisk to melt and combine. Add in powdered sugar, whisk to combine. Pour over the top of the cake in drizzles, or coat it completely. Put the cake in the fridge until cake cools and sauce hardens, about 1 hour. Serve cold for a brownie-like texture, or warm.